BACKGROUND: Anastamotic complications or leaks after esophageal or gastric surgery present an ongoing therapeutic challenge. Avoiding repeat surgery is desirable and may be possible with the use of endoscopically placed stents. We reviewed our single institution experience with the use of various endoscopic stents for the management of leaks and anastomotic complications after gastric surgery. METHODS: A retrospective review of our surgical administrative database was performed to identify patients who had stents placed in the operating room with upper GI endoscopy and fluoroscopic guidance. 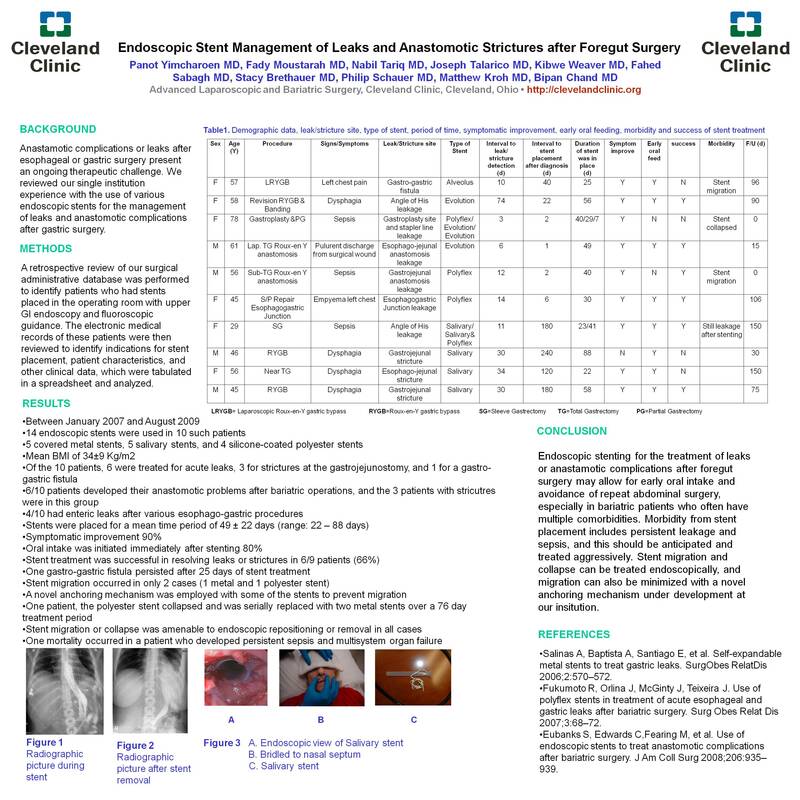 The electronic medical records of these patients were then reviewed to identify indications for stent placement, patient characteristics, and other clinical data, which were tabulated in a spreadsheet and analyzed. RESULTS: Between January 2007 and August 2009, ten patients had endoscopic treatment with stents for their leaks or anastomotic complications after esophageal or gastric surgery. In total, 14 endoscopic stents were used in 10 such patients: 5 covered metal stents, 5 salivary stents, and 4 silicone-coated polyester stents. There are 6 females and 4 males in this study with a mean BMI of 34±9 Kg/m2. Average patient age is 53±13 years (range: 29 -78). Of the 10 patients, 6 were treated for acute leaks, 3 for strictures at the gastrojejunostomy, and 1 for a gastro-gastric fistula. 6/10 patients developed their anastomotic problems after bariatric operations, and the 3 patients with stricutres were in this group; the other 4/10 had enteric leaks after various esophago-gastric procedures. Stents were placed for a mean time period of 49 ± 22 days (range: 22 – 88 days). Symptomatic improvement was observed in all but one patient (90%), who had a recalcitrant stricture. Oral intake was initiated immediately after stenting in 8 patients (80%). Stent treatment was successful in resolving leaks or strictures in 6/9 patients (66%). The 1 gastro-gastric fistula persisted after 25 days of stent treatment. Stent migration occurred in only 2 cases (1 metal and 1 polyester stent). A novel anchoring mechanism was employed with some of the stents to prevent migration. In one patient, the polyester stent collapsed and was serially replaced with two metal stents over a 76 day treatment period. Stent migration or collapse was amenable to endoscopic repositioning or removal in all cases. One mortality occurred in a patient who developed persistent sepsis and multisystem organ failure. CONCLUSION: Endoscopic stenting for the treatment of leaks or anastamotic complications after foregut surgery may allow for early oral intake and avoidance of repeat abdominal surgery, especially in bariatric patients who often have multiple comorbidities. Morbidity from stent placement includes persistent leakage and sepsis, and this should be anticipated and treated aggressively. Stent migration and collapse can be treated endoscopically, and migration can also be minimized with a novel anchoring mechanism under development at our institution.